One of the best apps for young girls that I have seen is Cover Creator by Discovery Girls. This fun app for the iPad, iPhone or iPod touch, is geared towards girls ages 8 and up, but even my 5 year old had a blast with it. Cover Creator allows girls to either take a photo or pick a photo and design a magazine cover with it. Cover Creator has hundreds of template with many choices of titles and cover lines, or have the freedom to design your own. Embellish your cover with stamps, pictures or your own art creations. When you are done, save it, email it or delete it! My daughters, ages five and eight, have really enjoyed playing with this. Here are a few of their creations. This one of their cousin and his friend is hysterical! 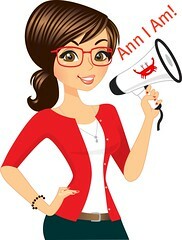 They even made a cute one with my blog button! You can tell they really had fun with it. They also love that they can share their creations with others via email. I like that everything on the app is fun and age appropriate. The title and cover lines are all age-appropriate with a variety of titles. You can purchase this app at iTunes app store at http://itunes.apple.com/us/app/cover-creator-for-ipad/id519149535?mt=8. Or maybe you want to try to win it, along with a subscription to Discovery Girls magazine. A little about the creators of Cover Creator and Discovery Girls. This company was created by a mother who wanted her 8 year old daughter to know she wasn't alone in the changes she was facing. When she went to look for a magazine for her daughter, she discovered that the available choices were too young or too old. There was nothing age appropriate for 8-12 year old girls that empowered them to grow be confident young women. So, she sat down with 12 local girls to brainstorm ideas. What came from it was Discovery Girls Magazine. I love that they never use models on the covers, but real girls--their readers! The magazine promotes positive self-esteem in young girls. Here is a great video to watch to learn more about it. To win the Cover Creator app and a one year subscription to Discovery Girls (six issues), enter the easy Rafflecopter giveaway below. Disclosure: I received the Cover Creator app for review purposes. I will also receive a free magazine subscription. As always, this post contains my honest opinions. My dd loves this magazine-she is only 7, but likes to copy her 15 year old sister:) i think it is hard for girls to stay happy with their age. Society seems to push them to be grown up too fast! Growing up too fast!!! I want my girls to stay girls as long as possible! I have 5 kids ages almost 4 months to 10 all girls but 1 boy. Girls at that age are hard because they grow up too fast and worry about fitting in & self esteem.